The course will provide an inspiring and highly informative preparation for students about to undertake an IB Diploma Program Visual Arts course at a school, or, an invaluable boost for students going into the second year of this 2 year course. The program is primarily skills based and extremely flexible and adaptable to the individual needs and interests of participants. Who Will Teach The Program? Bruce Sherratt is from the UK and is a veteran IB Visual Arts teacher and founding director of BCAC. Bruce teaches most of the classes. Bruce creates his own work alongside with course participants at the BCAC studio. Students also work with Balinese artists based at the center. Bruce has taught art at some of the world’s top international schools and exhibited in North America, Mexico, Europe and S. E. Asia. He is well known as an exhibiting artist in Jakarta and around the international schools community worldwide as an outstanding IB art teacher. What Will I Gain by Attending this Program? A big kick-start to the Investigative Workbook, and Studio components of the IB Visual Arts course. A program of study adjusted to your own interests, strengths and weaknesses. A clear understanding of how art in general is assessed and evaluated for merit. This will help you to understand the criteria examiners use to assess your work. A new and exciting dimension to your research and coursework, if you have already completed the first year. You will work through various processes specially designed to challenge, stretch and deepen your technical, creative and expressive skills in a variety of media. Your ability to create highly original and effective artwork will be dramatically increased and extended. You’ll take away with you, a powerful set of tools in terms of skills, inspiration and work strategies. All instruction and art materials. Pick up and drop off at the airport at the start and end of the program if required. Twenty-four hour access to studio and materials for independent work. Free all day access to the 7 galleries at the complex. The opportunity to work alongside Balinese artists based at the center. Why is Ubud, Bali, the Perfect Place to Study Art? With its rich culture and spectacular landscape, ‘The Island of the Gods’ is one of the most exotic and inspiring places on earth. In Bali, art is inseparable from the customs, beliefs, superstitions, history and survival of the people. Incongruously surrounded by glistening rice fields, Ubud is Bali’s artistic and cultural hub, with several major art museums, hundreds of galleries and a large, thriving international art community. There is a plethora of excellent inexpensive restaurants and cafes offering a wide range of Balinese and international cuisine. What is it Like to Study at BCAC? The studio is located on the ground floor with a gallery filled with art flowing through the large building, it is the perfect place to feel inspired and focus on your work. What Are the Studio Projects like and will I be able to do some Independent work? All the projects are inspired by the richly exotic culture, topography and people of this magical and exotic ‘Island of the Gods’. The skills-based projects are both challenging and exciting and are presented within a structured framework that provides ample space for personal initiative and invention. Each project concludes with a group discussion and evaluation of the work done. The studio at BCAC is available to program participants 24 hours. Will we have some time to relax and enjoy other parts of Bali? Leisure activities will depend on the preferences of individual students. These may include: dining, beach, shopping, hiking/walking, cycling. BCAC has two rooms above the studio available, see the Accommodation page for more information. We also have deals with local hotels and resorts if you would like us to help arrange a place during your stay. 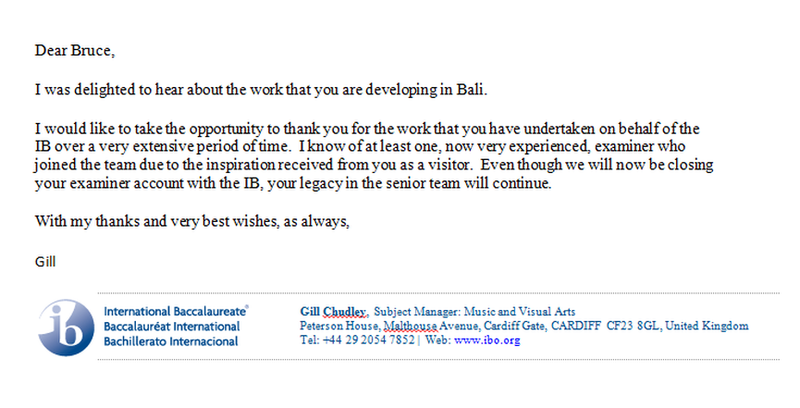 Gill Chudley - Subject manager: Music and visual arts for the IB examinations.